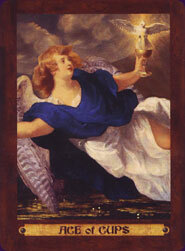 Today's Draw Classic*: Ace of Cups from the Touchstone Tarot. How much love passes through your life unnoticed? How much beauty goes by unappreciated? What could bring you joy today if you just stopped and looked?